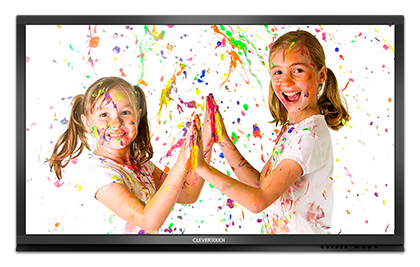 Clevertouch interactive touchscreens are changing the way we educate: the durable alternative to interactive whiteboard and projector solutions. With innovative features such as built in PCs and an app store focused on education, we are proud to install Clevertouch in a growing number of forward-looking schools. Available from 55” to 86”, Clevertouch utilises the latest touchscreen technology, featuring multi-touch that allows multiple users to interact and use gesture control. Combined with Full HD resolution, high-brightness and anti-glare as standard, images are always clearly visible. The Clevertouch is the only interactive display with it's own built in app store letting you start teaching straight from the box. Uniquely, it works without attaching a PC (although you can do that as well). Having over a 100 educational apps that engage and excite children in ways that are so natural to them, there is no barrier at all between the technology and their learning. Teachers love that the apps are vetted for children and all adverts and in-app purchases are removed. Oh, and did we forget to mention that all of our apps are free?